Twenty-five high school students from Hunter Math and Science High School in Manhattan joined us in the kitchen on Saturday, Decmber 3, 2010. We shared with them what’s cooking in TCK and then turned our focus to the students’ very favorite foods and personal care products. This included Pop-Tarts, Johnsons & Johnsons Baby Lotion, Axe Shampoo and Diet Coke. Using TCK tools, the students investigated their select products from the inside-out and remade the packaging based on their findings. Pesticides and petroleum in Pop-Tarts!? A string of carcinogens in Diet Coke? 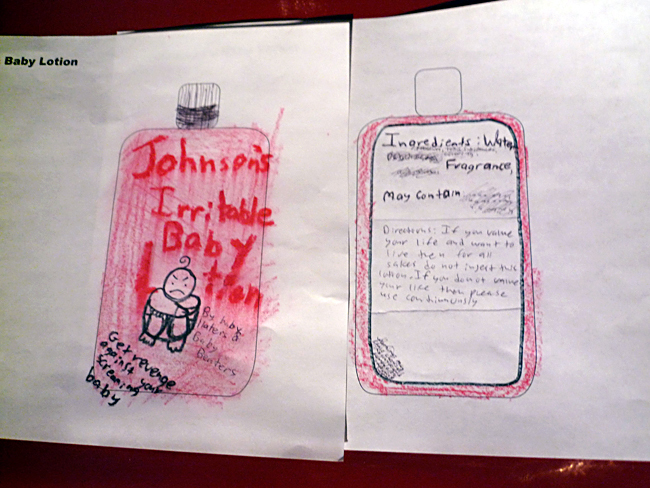 Thanks to the students’ new labels, you CAN judge a packaged good by its cover! We traveled up the block to the Robert Rauschenberg show at Gagosian Gallery to gain some inspiration in the way of collage making. Don’t you wish you were in Hunter High? !